The Lord welcomed home Hildegarde Marie "Toots" Knaebel, 96, of Moberly, Mo. 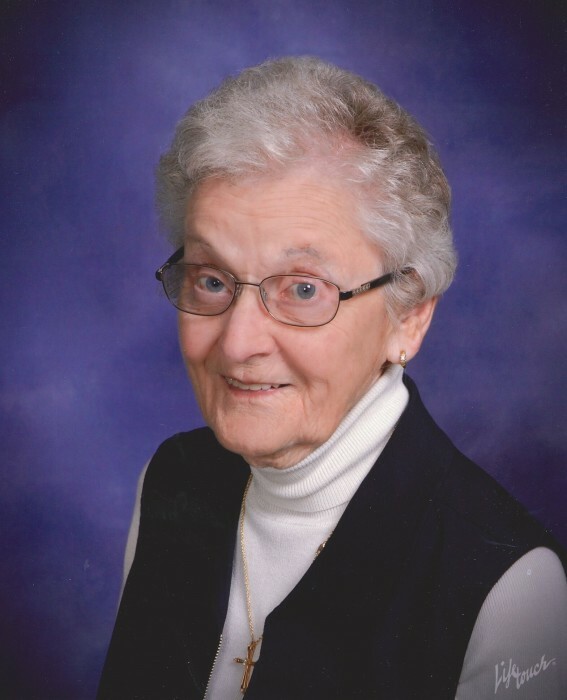 Hildegarde died Friday morning, April 5, 2019, at Boone Hospital Center in Columbia, MO. Hildegarde was born to Frank and Christine Kliethermes Berhorst in Westphalia, MO. June 29, 1922. Hildegarde married Joseph I Knaebel on June 20, 1942, in Westphalia, Mo. He preceded her in death in 2005. Hildegarde, along with her husband Joseph I Knaebel, co-founded Mid-Am Building Supply Inc. of Moberly, Mo., that employs over 400 people. Their operation includes service centers in Missouri, Kansas, Iowa and Illinois. She was a long time and dedicated member of the Saint Pius X Church where she attended daily morning prayer service, made home calls for funeral dinners, washed the Altar linens and supported the church and school financially. She was ecumenical in supporting other local churches by purchasing meal tickets and donating those meal tickets to everyone she knew. Hildegarde was a dedicated member of “Girls Night Out” with drinks and hamburgers followed by the arguments over who was paying the bill and leaving the tip. Hildegarde was on Neighborhood Watch 24 hours a day making sure everyone was well. The children from the neighborhood came to get donations for fund raisers and they never left empty handed. Hildegarde was the Family Historian, attending every Wedding, Funeral and Family Gathering possible. Hildegarde knew everyone in town and welcomed new comers. Hildegarde was an avid cook making sure the refrigerator and freezer were always full of treats for the Grandchildren and Great Grandchildren. The Brick was a well-known gathering area for breakfast and lunches with family and friends. She was a member of The Moose Lodge, The Eagles, MACC Booster Club, MU TSF Scholarship program. For 96 years God has truly graced this earth with the presence of a beautiful lady. We who know and love her have not only received her affection and unending care, but have also seen her example. Thank you and God Bless you, Hildegarde, for all that you have given us. Surviving are her children: Mary Ann Knaebel-Chavis and her husband Eric of Alpharetta, GA; Chris Haik and her husband Bob of Springfield,Mo; Lilly Elliott and her husband Dave of Moberly; Betty Sundermeyer and her husband Mel of Holts Summit, MO; Joe Knaebel and his wife Mary of Moberly; Rich Knaebel and his wife Barb of Huntsville, MO; Al Knaebel and his wife Pam of Springhill, KS; 20 Grandchildren; 39 Great Grandchildren; sisters-in-law Rose Dorge and her husband George, of Taos, MO, Ann Knaebel; brothers-in-law, Jake Knaebel and his wife Anna Marie, all of Jefferson City, MO, Art Knaebel and his wife Jenny of Raytown, MO; nieces, nephews, other relatives and friends. In lieu of flowers, the family requests that all Memorial Donations be made to Hildegarde Knaebel Scholarship Fund and may be sent to Joe Knaebel, 2233 Highway M, Moberly, Mo. 65270. A Mass of Christian Burial was held at the Saint Pius X Catholic Church. Committal prayers and burial followed in the St Mary’s Cemetery.